In our never-ending quest to bring you the best and most unique transport stories, we were recently informed by a colleague of a curious transit system in Malaysia named the Malacca Monorail. Being true transit geeks (and huge fans of the Simpsons), we had no choice but to personally visit it ourselves. This 1.6km, 2 station system is located in Malacca City — a World UNESCO Heritage Site and home to half a million residents. Today, the state is a huge tourist destination and welcomed a reported “13.7 million” visitors last year. So as a way to add recreational infrastructure to the city, the RM15.9 million (~USD$5 million) monorail first opened in October 2010. Unfortunately, in an uncanny resemblance to the Springfield Monorail episode, the system infamously broke down during it first day of operation! Malacca Monorail train at Hang Jebat Station. Image by CUP. In fact, during its first year, it broke down a total of 21 times as it suffered from a range of mechanical issues — not the least of which included loose door screws, software glitches and engine problems. Perhaps the most absurd discovery was that the system was found to be inoperative during rainfall. This would probably be a non-issue if the monorail were built in a desert — except unfortunately for the Malacca Monorail, it’s located in the tropics where precipitation is a common occurrence. The seemingly abandoned Hang Tuah Station. Image by CUP. And instead of selecting experienced manufacturers, decision-makers chose a little-known company from China called Unis Technology Company Limited (no word on whether these guys wore bowler hats and sang a song). Undeterred that they’ve already made a bad investment, officials went on to announce the second phase of the monorail at RM13.2 million (~USD$4.1 million) in December 2011. Not surprisingly, despite its scheduled completion date of February 2013, the second phase of the system was never fully built. Interestingly enough, if you sail down the river today, you can actually see some of the unfinished columns as a reminisce of the ambitious yet unsuccessful project. Unfinished columns along river. Image by CUP. So while it was originally designed to provide tourists with a 30 minute ride alongside the Malacca River, the entire system is essentially now a white elephant. Even though I’m still failing to come to grips as to how a real-life Springfield Monorail came to be, the Malacca system does offer a very important lesson for all future transportation planners: if you choose to build transport infrastructure, please, please, please remember to choose someone with a proven track record. But hold on, perhaps I’m missing something in all this. Could this have been preplanned? Now that’s an achievement worth getting recognition for! Light Rail is a scam. Pickrell, A Desire Named Streetcar by Don H. Pickrell (1992, Journal of the American Planning Association). Flyvbjerg, Demand Forecasts by Bent Flyvbjerg, et al (2005, Journal of the American Planning Association). DOT ridership cost report by the US Federal Transit Administration (2008). The Pickrell piece is insanely readable for something as mundane as transit ridership forecasting. If you only have time to read one, this is the one you should look at. It gives a rather disturbing insight into how public transit is planned, funded and built in North America. The Flyvbjerg piece, meanwhile, is a little more technical but nevertheless eye-opening. In fact, most of Flyvbjerg’s work is essential reading for anyone interested in how we (in)effectively conduct mega projects in the developed world, particularly in regards to public transit. If you take the time to work through his materials, you’ll come out the other end with a different mindset than when you entered. The FTA piece, lastly, is boring beyond belief. But is great as a reference point to see how this all comes together. In it, you’ll find out which LRT systems in the US are the star performers (they’re not the ones you think), which are the true dogs (they probably are the ones you think), and which ones are middling at best (a few surprises). If you’re a transit nerd, you need to read these. How many of you own this? Image by Tom Raftery. Quick! Hands up if you own an iPad! The post was titled All Aboard The Canadian Hydrogen Overhead Monorail Express and dealt with Canadian Inventor Frank Illguth’s dream of a high speed monorail that doesn’t need to stop for boarding and alighting passengers. So does Mr. Illguth’s coach slipping monorail constitute a genuine invention or is it just the repackaging of an old idea? Doesn’t matter, that’s for the patent lawyers to decide and not the point of this post. The response on Human Transit to Mr. Illguth’s CHOME was predictably and overwhelmingly negative and sarcastic. Mr. Illguth, meanwhile, didn’t help his cause any. He offered little evidence of his idea’s worth and caught the ire of the group by deriding other commenters and their “crap opinion(s)” – his words, not mine. The discussion goes on and on and – as is typical of this kind of argument – one individual reiterated the oft-told and sacred rule of transit planning: stick with established technologies and a reputable manufacturer. But how does one define an established technology? And more importantly, how does a technology become established? It’s like the recent graduate who can’t get a job due to a lack of experience and is told to remedy the problem by getting a job so as to gain experience. It’s a paradox and it doesn’t help anybody. It’s not like we’re talking about fire or gravity here. Trains, buses and streetcars haven’t existed forever. At some point in time someone had to invent from nothing whatever transit technology you currently ride. And by virtue of that act of invention, every single transit technology in history has lived through a period of not being established. One could argue that every major transit innovation/invention of the last 200 years was a deliberate and revolutionary act against the status quo. Horse drawn omnibuses led to San Francisco style cable cars which led to electrified streetcars which led to diesel-powered buses which led to LRT and BRT. In other words, innovation and invention was always key. But somewhere along the line we traded that spirit of invention for a policy of establishment. Stick with established technologies and a reputable manufacturer. Good for the reputable manufacturers and established technologies, not so good for everyone else. It’s nothing more than the No City Wants To Be First Problem: No city wants to be first with a new idea, but should the idea prove successful, every city wants to be second. Our cities have become the world’s largest riders of coattails and those responsible are strangely proud of it. I know nothing about Mr. Illguth’s monorail and I doubt it will ever see the light of day. But guaranteed, if Mr. Illguth does find a city willing to implement his technology and it proves to be every bit as wonderful as he claims, cities will be clamoring for it. Same thing with the new London Heathrow PRT. Or the Chinese Tunnel Bus™. Or my CableRailGyroCopter (patent and trademarks pending). Will every new idea pan out in the end? Of course not, but that’s okay. That doesn’t mean the act of innovation and invention is inherently something to avoid and fear. That we have an unwritten rule that is actively hostile towards the new doesn’t make it any easier, but that’s just the way it is right now. New is hard, long and difficult. But it’s worth it. 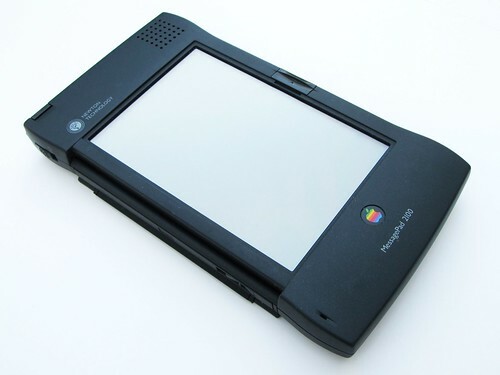 Now to get back to that whole iPad question: How many of you ever owned a Newton? Apple iPad circa 1987. Image by moparx. The Wuppertal Schwebebahn in Central Germany. Image by JuergenG. In the central German city of Wuppertal is a piece of transit infrastructure completely unique in the world. While the age of the system gives its infrastructure considerable heft, it’s not at the expense of the urban environment. The green support structures arch gracefully and their conspicuously large steel rivets conjure images of turn-of-the-century skyscrapers and the Eiffel Tower. Much of the Wuppertal’s route lies overtop of the local river. Whereas some might have thought such a scheme would only be useful for crossing rivers, Wuppertal planners were wise in recognizing the other more intrinsic value of river corridors: Running along a river instead of across a river opens up wide areas of public space and provides an attractive view for riders. 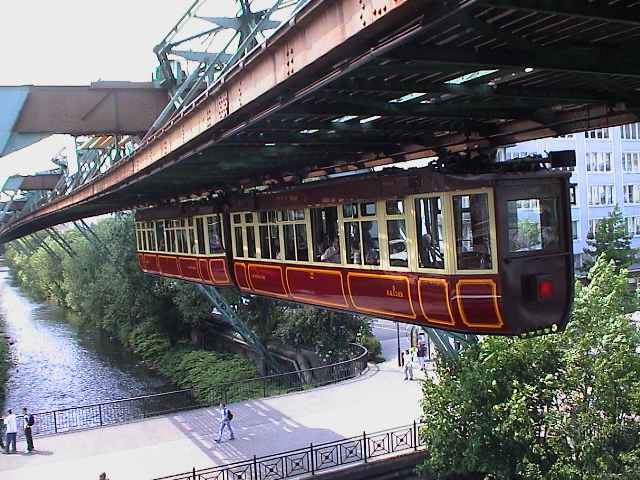 The Wuppertal Schwebebahn shows how aerial transit systems are not only possible, but elegant, practical, safe and efficient. The Schwebebahn has an excellent safety record, and is still an essential part of that city’s transit infrastructure; not just a toy for tourists. It also suggests how an aerial gondola system might be similarly configured/integrated into the urban environment. Special thanks to Christian for suggesting I discuss this unique and amazing system. I recently travelled to Las Vegas, Nevada to explore that city’s two public cable systems. This is Part 2 of a 3 Part report on the Mandalay Bay Cable Car. The Mandalay Bay Cable Car is the kind of cable installation I love. It’s a modest, unassuming workhorse that demonstrates why cable is just so attractive a technology. It’s fast, it’s got heft and it just feels right. I know it’s impossible to quantify such a subjective concept, but – believe me – I’ve ridden several cable systems that didn’t feel right and this one does. In fact, it feels almost perfect. The Mandaly Bay Cable Car Map. Note the Express Line and the Local Circulator Line. Image by Steven Dale. FIRST. Because it is a hotel resort system, capacity is at least somewhat determined by people with luggage. As anyone who comes to Vegas will do so with luggage, that luggage must be accommodated for. The more luggage, the less people. This fact somewhat artificially drives down the stated capacity of the system. During times of conferences and conventions, when people from all over Vegas descend on the Mandalay Bay, the system operates well over stated capacity without trouble, a testament to the previous statement. SECOND. The system actually operates two separate independent shuttles. One is an express connecting the Excalibur and Mandalay Bay resorts in a single swift minute, whereas the second line is a local connector with intermediary stops at the Luxor and a second Excalibur station. This is a revolutionary alignment that most higher order transit technologies don’t even accomplish. This dual track, dual purpose configuration, however, complicates matters of capacity as well as questions of connectivity. From the main Excalibur Terminal, there is no direct connection to the Luxor or the secondary Excalibur station. To access either of those stations, one must first take the express line to Mandalay Bay, then transfer to the local and retrace backwards to either the Luxor or Excalibur intermediary station. It’s a truly ludicrous design to any rational transit planner. But remember: This is Las Vegas. Transportation and rationality are completely anathema to this world. The purpose of the Mandaly Bay system is not to get you to the Luxor or the secondary Excalibur station. The purpose is purely to get you to the Mandalay Bay. It may be a piece of planning absurdity, but it’s also a piece of marketing genius, and it was intentional according to those I spoke with who work with the system. Any movement on the cable car is filtered through Mandalay Bay, ensuring maximum exposure. It is, in essence, the Freemium Model of public transit. Mobility is offered to everyone and anyone free of charge, the price is allowing oneself to be exposed to one giant Mandalay Bay advertisement. It was no mistake, after all, that the Mandalay Bay station is located deep within the heart of the complex, whereas the other stations require a long walk through their respective casinos. So is it transit? No. But does that question really matter? I don’t think so. The Mandalay Bay cable car was always much more about marketing than it was about mobility. It’s important to analyze a system based upon its strategic goals. Not only has the cable car been an enormous marketing success, it has also (bizarrely) succeeded as transit in ways other Vegas transit systems haven’t, namely the Las Vegas Monorail. Whereas the not-for-profit owned Las Vegas monorail is far longer and offers better connectivity, it is so much more irrelevant than the Mandalay Bay system. One doesn’t even know the monorail exists and one really doesn’t care to. In fact, it’s totally common to find websites and forums that confuse the Mandalay Bay system for the Las Vegas Monorail. But at a $6 per trip price tag, it’s hard not to understand why the Las Vegas Monorail drives users away. Ironically, the Las Vegas monorail as a fare-based system is a perpetual money loser that has struggled financially and technologically since it opened. The Mandalay Bay cable car, meanwhile, is free and is seen by its owners as a complete success. So much so, MGM has just recently opened a second cable system linking three other resorts (more on that system in the future). I’ll wrap up this report tomorrow with a discussion about the Mandalay Bay cable car’s visual aesthetics and station design. It’s a classic episode and the analogy is apt. After all, advancing the idea of ski-lifts as transit appears to be hucksterism at its best. The difference, of course, is that Cable-Propelled Transit is a demonstrable success and monorails aren’t. Monorails are rare in the world and are so prohibitively complex and expensive they tend to become technological albatrosses. Ask anyone in Seattle. You may think otherwise, but selling monorails is hucksterism. Advocating for cable isn’t. So for those of you out there biting at the chomp to make the comparison, let me say this: I’m a terrible singer, I don’t earn a commission on any cable technology sales, I don’t know Leonard Nimoy, and I’ve never worn a bow tie in my life.